Many thanks to the generosity of the City of Helsinki for welcoming SNL attendees with an Opening Night Reception to be held in the exquisite Banquet Hall of the Helsinki City Hall. 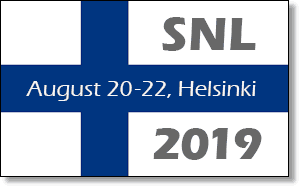 The reception will open with a Welcome Address from a City of Helsinki official, after which SNL attendees will enjoy a delicious salad bar buffet, wine and refreshments. Helsinki City Hall, Helsingin Kaupungintalo, is the central administrative building of Helsinki, the capital of Finland. Located in the Kruununhaka district, City Hall features a beautiful white and blue façade in the imperial style and overlooks the bustling Market Square. 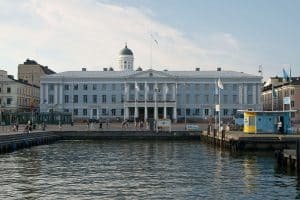 Designed in 1833 by the famous German architect Carl Ludvig Engel, the building served as a cultural entertainment hotel until it was acquired by the city in 1913, renovated, and christened as the Helsinki City Hall in 1932. 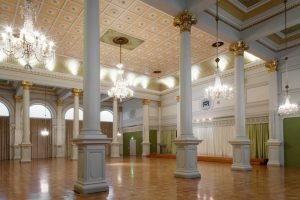 The interior was modernized the 1960’s, but the resplendent Banquet Hall has retained its elegant 19th century form. The walk from the Finlandia Hall to the Helsinki City Hall is 1.8 KM, about a 20 minute walk. You can also take tram 4 from Finlandia Hall to the beautiful Senate Square and then walk one block to the City Hall. For guests needing extra assistance getting to the event, please contact the SNL Registration Desk. Join your colleagues for an an elegant evening of food, drinks and stimulating conversation immediately following the first day’s sessions at Finlandia Hall. Guests of registered SNL attendees are welcome to attend the reception!